Cleveland’s cultural landscape is saturated with dynamic forms of expression. Its people are doers and makers; they are independent in their thought, yet collaborative in their expression. Cleveland’s bridge, the Detroit-Superior Bridge, is a relic of the past, showcasing signature architecture and lasting endurance. Together they create the Detroit-Superior Commons. 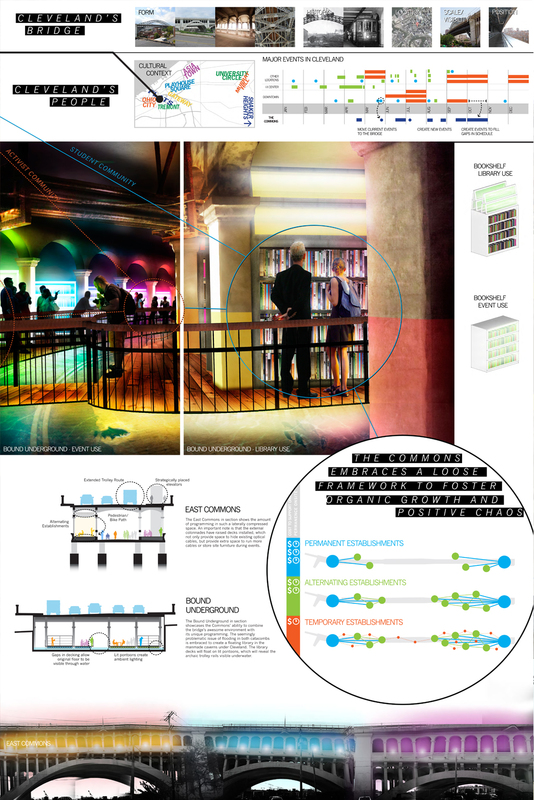 The Commons is the newest arena for intense clustering and combining of the cultural landscape, common to Cleveland. It brings cultural champions from across the city and gives them a place in proximity to other forms of cultural expression. 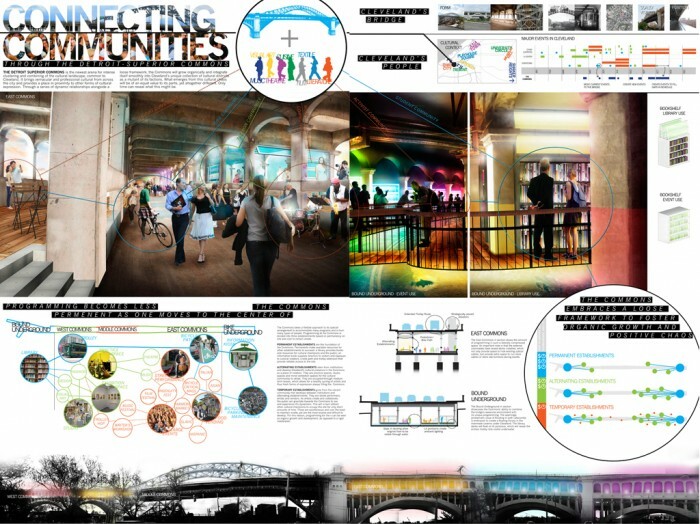 The Commons accommodates as many cultural groups as possible, from the traditional food and dance of Little Italy on Murray Hill, to the professional yet accessible urban interventions of the Cleveland Urban Design Collaborative, to the fashion designers for Cleveland’s International Fashion Week Cleveland. These cultures will combine to introduce new and fresh forms of expression into Cleveland. 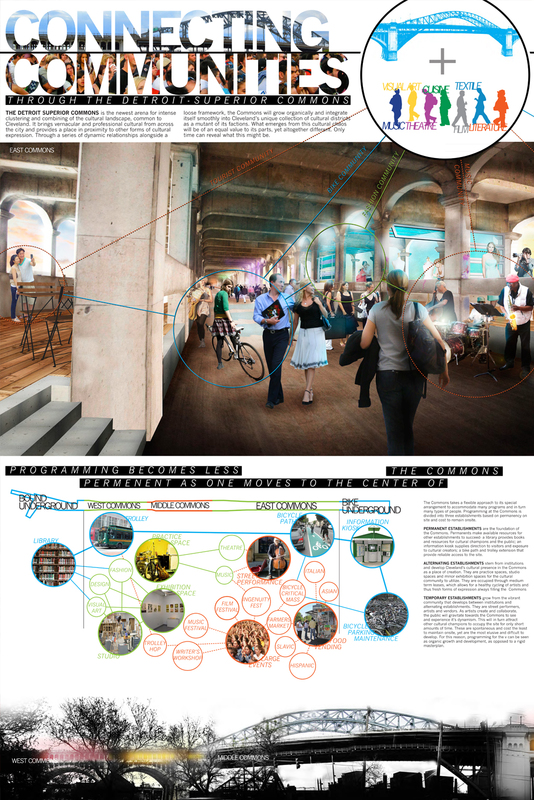 By structuring the Commons by dividing its activities by onsite permanence, a series of dynamic relationships creates a loose framework, which will allow the Commons to grow organically and integrate itself smoothly into Cleveland’s unique collection of cultural districts as a mutant of its factions. What emerges from this cultural chaos will be of an equal value to its parts, yet altogether different. Only the Commons will show us what this can be.